Now there’s a scary name for a plant. The Virginia Creeper. Sounds like something you’d want to stay away from around Halloween, for sure. It’s a native American plant that’s common in wooded areas, and it grows so prolifically that you’d think it would be easy to encourage it to grow in your backyard, but like all wild things, it’s tricky to domesticate. Wildings have a tendency to grow where they darn well choose, living life on their own terms, ignoring humans’ best efforts to pamper them. I’ve tried to lure the Creeper up my trellis, get it to drape itself over my hedges, or convince it to twine around my door, all in vain. It creeps away and does exactly what it pleases, making gorgeous festoons of red in the forest but shunning my garden. This, alas, is not my trellis, which is sadly bare. 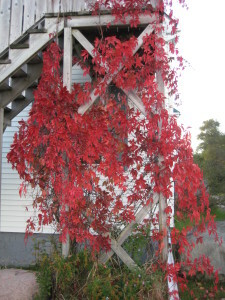 I have to applaud these gardeners, whoever they are (I took this picture of a house I happened to pass in a small town in New Brunswick, Canada) They managed to attract the elusive creeper, and have been rewarded with the brightest splash of fall crimson I’ve ever seen. This is a particularly good fall for autumn colors—I suspect the rainy spring and summer, and then hot sun in August, were the perfect combination for leaves to manufacture lots of sugar, which of course is what gives the leaves that rainbow effect after the green fades. Virginia creepers, even in less colorful autumns, tend to be garish. It’s a matter of survival for them. They have berries which attract birds, and therefore want to attract as many birds as possible to eat the berries (and therefore disperse the seeds.) So after a summer of anonymously creeping around the forest and the backyard, Virginia creeper suddenly announces its presence in no uncertain terms: bright red! Berries here! Come and eat! Maybe this winter a bird will land in my front yard and excrete a baby Virginia creeper for me.